Officers gave jaywalkers lessons on traffic lights, zebra crossings, subways, overhead bridges, traffic rules and regulation and general civic responsibility. MTPD data shows 45 percent deaths of road accidents in Nepal occur because people cross roads in a haphazard manner. The MTPD has set up check posts at 22 zebra crossings in the valley and 12 places in over-head bridges. not use zebra crossings and overhead bridges in Kathmandu. In Lalitpur, officers gave lessons to 153 rule violators. On the first day of the drive, traffic police booked 400 people in Kathmandu and 189 in Lalitpur. The MTPD has deployed 200 traffic police officers at various places in the valley from 9-11 am and 4-6 pm. The MTPD had run such a campaign initiative last year. Officers had slapped jaywalkers with Rs200 fine for violating traffic rules. However, it was withdrawn later following severe criticism from public. The then Home Minister Janardan Sharma instructed the MTPD to withdraw the decision. Traffic police are running on road classes at Thimi, Koteshwor, New Baneshwor, Thapathali, Jorpati, Purano Bus Park, Gausala, Kalimati, and Kalanki including other places where there are zebra crossings are available. 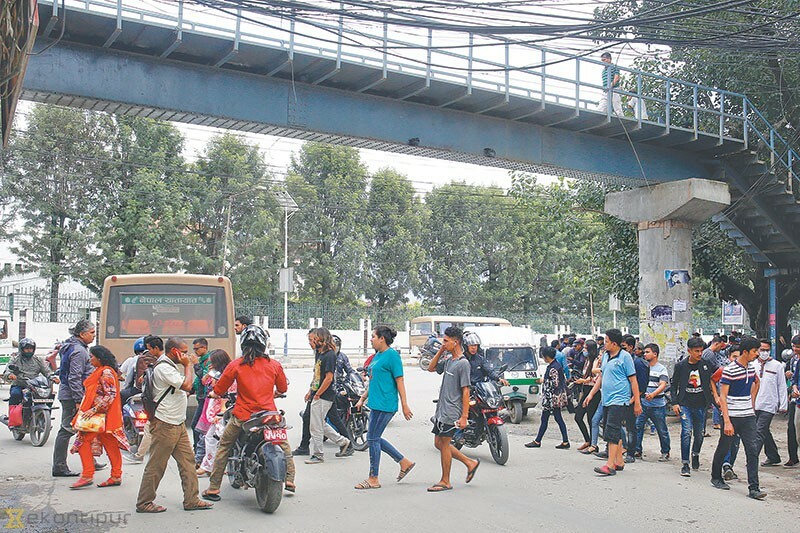 Traffic police are also running the on road classes where there are overhead bridges such as in Bhotahiti, Jamal, New Bus Park, Ratnapark, and Sahid Gate.